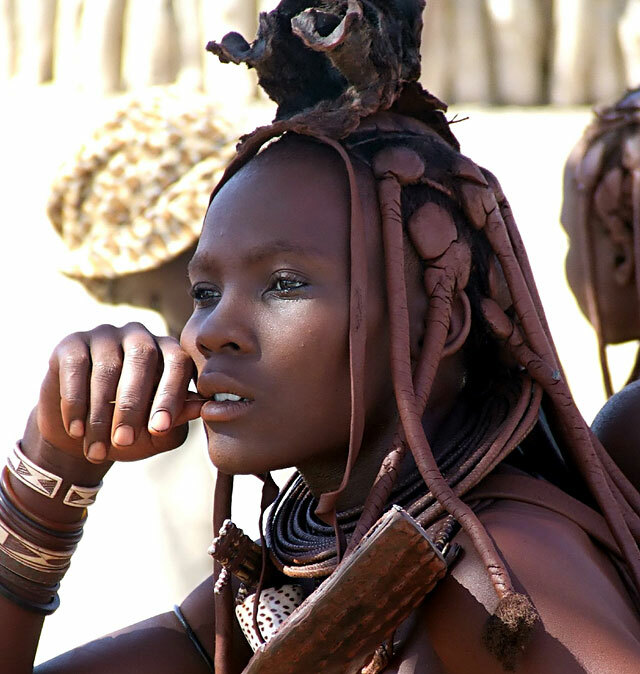 The beautiful Himba girl in the above picture is married as she is wearing ornaments on top of her braided hair. These ornaments, which young unmarried girls do not wear, identify her as being married. Note also the ornaments around her neck and the conch shell that hangs above her breasts. The conch shell is only worn by married women and is a symbol of fertility. In addition, they often wear a leather plate with metal studs that hangs down their backs. Every morning, Himba girls start the day by covering themselves with a cream made out of butter fat, herbs, ash, and red ocher. The mixture offers some protection against the harsh desert sun, but its primary function is to tint the body a reddish-brown color which Himba girls and women find appealing. In contrast to Himba girls and women, Himba men do not use the red ocher mixture and often wear western clothes.